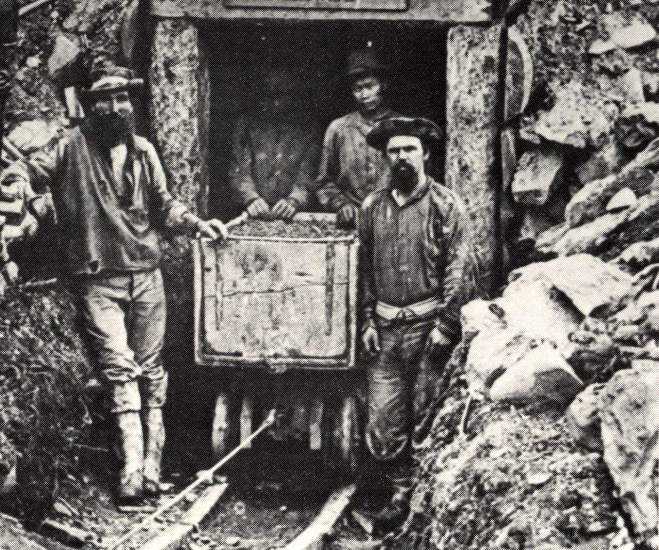 Search over 66,000 records of goldminers from the goldrushes of New Zealand spanning the years 1861 to 1872. Notes on the Thames Goldfields. The Major Goldrushes of the 1800s. 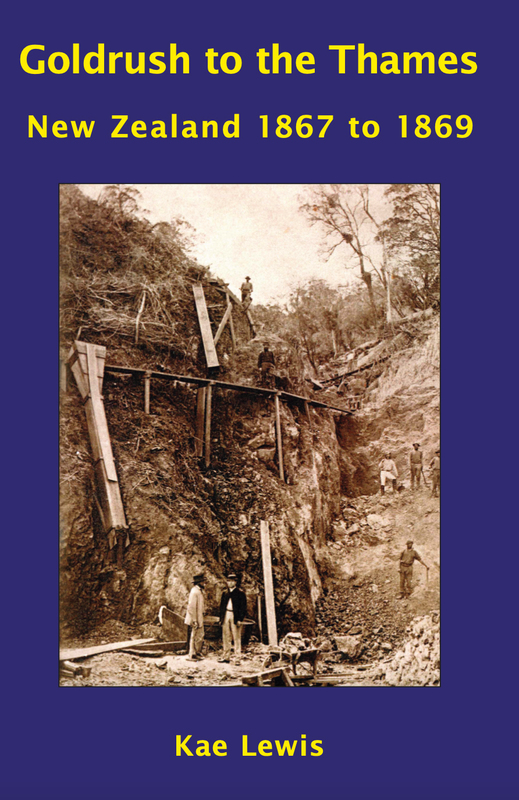 This book tells the story of the Thames Goldfields when thousands of miners were digging for gold high in the ranges behind the Thames township, beginning 150 years ago in 1867. The book documents almost all the important claims on the Thames and Tapu Goldfields, describing the individual workings on each claim and the methods they used to find and retrieve the gold. In conjunction with the GOLDMINERS' DATABASE on this website, it goes a long way towards answering the questions: Who were the diggers? Where was their claim? How did they find the gold? Did they find any? Both versions are now available to order directly from the Printer ZoePrint in the United States. They accept credits cards and can ship worldwide. The cost of the larger version of GOLDRUSH TO THE THAMES is US$120 for the set of two volumes, plus postage. A new abridged edition (324 pages) is now available at a cost of US$49.90 plus postage. Both books are also available to buy in New Zealand at select bookshops: CARSON'S BOOKSHOP at Thames. They also stock the abridged version. Also available at the ROCKSHOP at The Thames School of Mines. Cost NZ$85 for the original 777 page volume, and NZ$50 for the abridged version. Copies are also available to buy online in New Zealand at The Treasury, Thames, or visit their SHOP for more details. The larger complete volume of this work, 777 pages, is now indexed in the GOLDMINERS' DATABASE on this webpage. If there is more information about a particular claim in the large version of the book, you will be given the page number. This does not apply to the abridged version, which does not give the details of claims but is simply the story of the Thames goldfield for the more casual reader. Anyone interested in details of all the mining claims or genealogy should order the large version. METHODS USED TO FIND GOLD IN THE GOLD RUSHES OF THE 1800s. Specs, grains and occasionally nuggets of gold were found loose in the sands and gravels of rivers or alluvial soil, especially in California USA, Victoria Australia and Otago New Zealand. Click to check the pan for gold. The gold can be picked up from the pan by dissolving it in mercury. The mercury-gold amalgam is then burnt off to leave behind the pure gold. 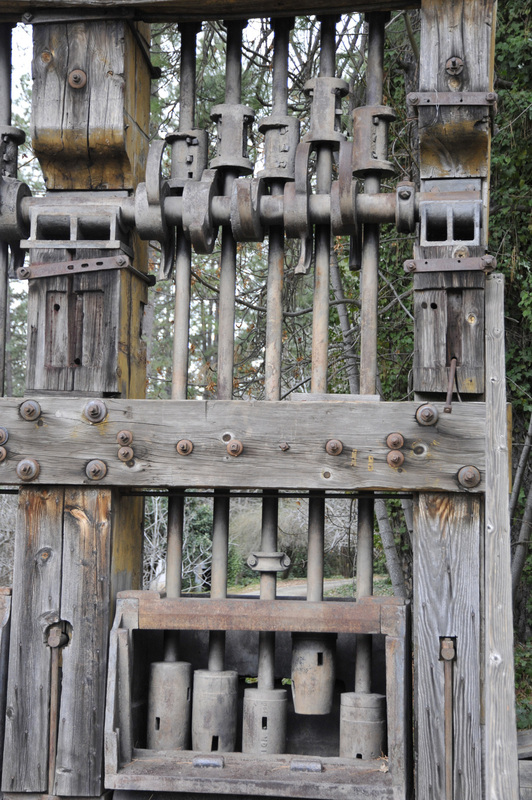 The old miners did not appreciate how bad this was for their health. More efficient than a pan, a cradle relies on the prinicple that the heavier gold will fall to the bottom and be caught on a blanket as the cradle is rocked. A steady stream of water ensures the gravel is washed through, hopefully leaving any colour behind. The heavier gold is caught in slats, raffles or a blanket as the gravel passes through the sluice box in a steady stream of water. Photo from Alexander Turnball Library, Wellington. A powerful jet of water is used to wash away the hillsides and river banks, hopefully releasing the gold-bearing soils. 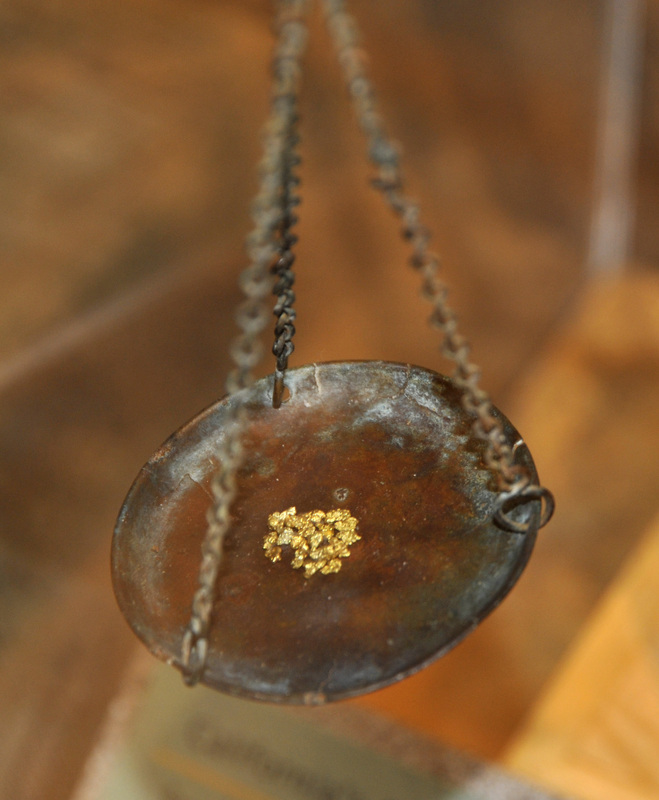 Gold can then be extracted from the loose soils using a pan, cradle or sluice box. 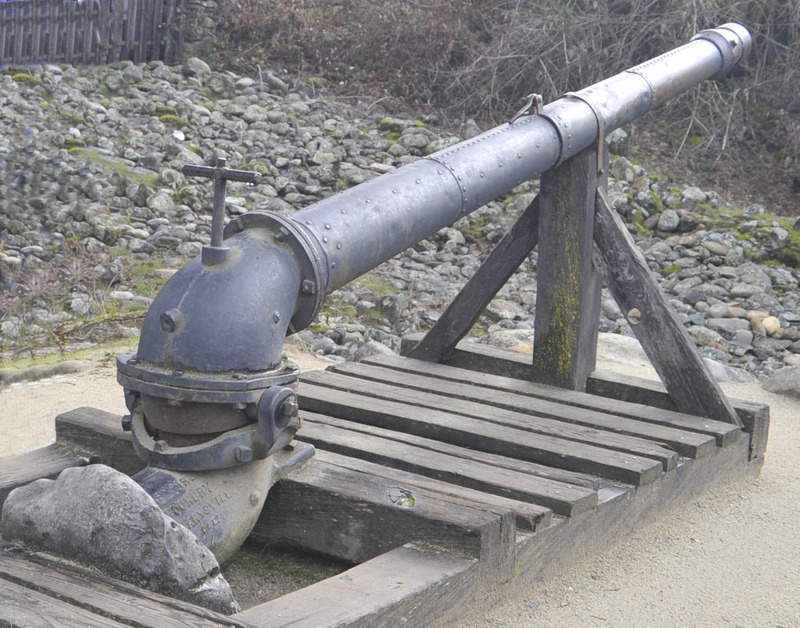 A sluice gun being used to wash gold from the river banks at The Goldfields Mining Center, Kawarau River, Otago, 2012. Gold could be handed in to the Government Gold Receiver or exchanged with merchants in town. At the General Store, they could exchange their gold for supplies of food, mining tools and in the case of quartz miners, for blasting powder. Even the hotels and restaurants kept weighing scales to settle the bills in gold. The Bank of New Zealand, Bank of New South Wales or The Union Bank of Australia were all operating on the New Zealand Goldfields and would purchased gold from the miners who could keep a credit on record at the Bank, or take the cash if they needed it for running expenses. Many miners held on to their gold but this was a dangerous practice with armed bandits always waiting for an opportunity to take it from them. Gold Bars Pile up in Bank Vaults. Gold dust and nuggets were melted down and purified by the banks, and turned into gold bars. These were taken under high security to the nearest port for shipping to the London gold markets. In the 1860s, this meant a slow, hard grind with a pick axe, shovel and a wheelbarrow. Quartz gold is found underground in the main reefs or subsidery veins in the living rock walls. In Thames, New Zealand in 1868, a few rare reefs were on the surface but most were 100 - 200 feet below. The miners had to create a network of shafts and tunnels in the hard rock in search of the lodes of gold. A quartz mine at Waiotahi, Thames, New Zealand which shows how the miners followed a gold-bearing reef as it plunged towards the center of the earth. 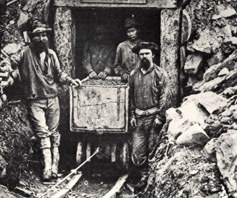 It required a considerable outlay to start a mine like this, and the individual miners of the 1800s often did not have the cash to develop the full potential of their claim. They banded together in groups of 4 - 20 men to pool their resources, or formed a company to raise finance. Shares in the Gold Mining Companies were traded on the streets of Thames from 1868 onwards. A tour of an abandoned mine at Coromandel. Quartz showing a vein of gold. 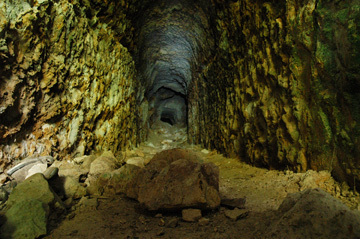 Because Quartz laden with gold is extremely heavy, a tramway was contructed to get it out of the mine. Then the rails could be extended to take the quartz all the way to the battery for crushing. A good example of this is the Una Tramway at Thames, New Zealand. The quartz had to be crushed or pulverized to release the gold as dust. The batteries could have any number of stampers, in this case five. This was a small more mobile stamper which could be taken to the mine entrance. A five-stamper quartz battery and a berdan in operation using water power and a pelton wheel at The Goldfields Mining Center, Otago, 2012. 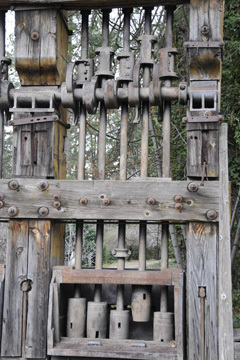 Operating the stampers required a supply of running water to operate a water wheel or pelton wheel and for washing out and sluicing the pulverized quartz. Many of them were steam-powered, which also required a good source of fuel and water. 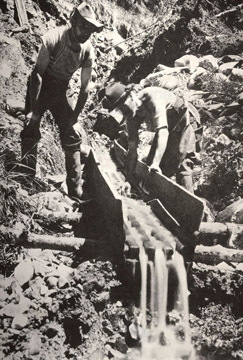 The stamper batteries were placed either beside a stream, or alternatively water was brought in using a water race. and carry it away to the bank. © The content of the entire GoldRush Online website is copyright and not for reproduction on any other website. This webpage was composed and compiled by Kae Lewis in memory of her great great grandparents Edward Hooper and his wife Elizabeth Ann nee Bates. Like everyone whose name appears on this website, they also answered the call of the gold. Edward Hooper arrived in Otago New Zealand in 1861 as an unmarried 30 year old miner in time for the opening of the goldfield at Gabriel's Gully. Later he returned to Australia where he married Elizabeth Ann Bates in South Australia in 1863. While Edward worked in the copper mines at Burra Burra, South Australia, Elizabeth gave birth to a son in 1864 and a daughter in 1866. Then gold was proclaimed in Thames New Zealand in August 1867. With two toddlers and another on the way, Edward and Elizabeth boarded a ship to New Zealand, landing on the shore at Tapu in the middle of winter, just in time for Elizabeth to give birth to another son in October 1868. Edward set to work immediately, taking out a Miner's Right at Tapu in July 1868 and another in August 1869. In April 1869, he bought a share in a mine named Count of Mont Cristo at Tapu with four other men. Elizabeth gave birth to another son, Herbert George Hooper (the great grandfather of Kae Lewis) at Tapu in August 1869. They now had four children under the age of 5, and against all odds on the goldfields in these days, kept everyone alive and thriving. By 1873, when their 5th child was born, the Hooper family had moved to Gisborne where Edward worked at the Makauri sawmill owned by William King. They lived in Gisborne for the rest of their lives and had 8 children altogether. Elizabeth died in Gisborne in 1894, Edward in 1899.